Polyethylene bags provide affordable packaging solutions for a wide cross-section of items. In fact, the versatile bags are used for all kinds of applications, across the spectrum of industries. Consumers are poly bag end-users too, calling on the flexible bags for a variety of household uses. Poly bags provide essential protection in nearly unlimited sizes and shapes, making them ideal for many products. Specific bag styles address particular needs for packaging, including poly bag options used primarily to protect items during shipping and storage. Various thicknesses of bag material provide diverse solutions, supplying inexpensive thin poly coverage or high-strength fortifications as required. Whatever you need bagged, polyethylene alternatives are available is styles, sizes, shapes and densities appropriate for your project. Polyethylene is the most widely used form of plastic, with low-density and linear low-density poly materials commonly used for making bags. Several styles exist, each appropriate for certain applications, and some bags are custom-crafted for specific contents. Balancing the level of protection you need with the costs of thicker bag materials provides affordable safeguards, without compromising the standards required to keep your products safe. Flat – Flat poly bags are used when clear presentations are desired, but affordability is paramount. The cost-effective approach highlights bag contents, providing limited protection against dirt, dust and handling damage. If you regularly ship documents and other flats it pays to keep thin poly bags on hand to protect them in transit. Gusseted – Irregularly shaped or bulky items benefit from gusseted poly bags designed to expand when filled. Gussets create a form-fitted look, without using custom bags and serve a variety of packaging needs. Colored – Poly materials are available in multiple colors to support your branding strategy or shield bag contents from light and scrutiny. 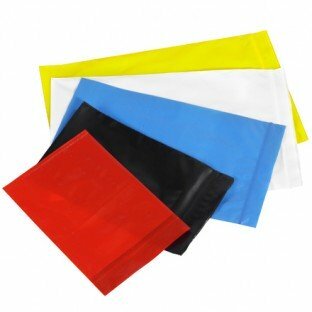 Packing your own products in poly bags from bulk stock gets a merchandising enhancement from the use of colored poly bags, which sets them apart from clear competitors. Clear bags can also be embellished with colorful printed graphics and logos. Re-sealable – Depending on the items you regularly work with, re-sealable poly bags might provide the best solutions for your shipping room. Options include familiar grip-seal closures that pinch closed as well as slide alternatives incorporating a plastic slider to get the job done. Bag strengths come in light, medium and heavy-duty alternatives, including high tensile strength varieties that allow enhanced protection even with thin-walled bags. And to dial-in protection even further, some poly bags are crafted specifically for certain items. Garment bags, for instance, keep clothes shielded from harm during transport. And mattresses are regularly protected in the same way, with large fitted poly covers. These and other specialty poly bags are available in rolls for dispensing as needed in higher-volume situations. Special poly specimen sample bags are used to preserve medical samples and sensitive crime scene evidence. White block alternatives incorporate writable sections into each bag for easy labeling. Shippers use large poly bags to guard against damage during transport. Pallet covers and bin liners are precisely fitted for their purposes, in clear or black poly varieties. Additional bags and accessories are available from packaging providers prepared to furnish quotations for your shipping and packaging needs.